I picked up the book after Grove passed away this year and I found it so succinct, so clear, and so packed with easy-to-understand analogies. It really gets to the heart of what good management is. 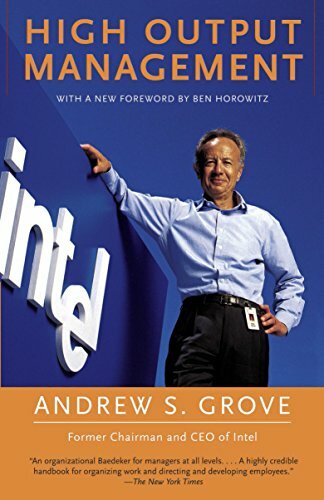 I'm a really big fan of High Output Management by Andy Grove, who is the former CEO of Intel. He talks about how he thinks about management and systems thinking in general and what he did to build Intel into the company that it is today. And I think there's just a lot of great lessons for not only management and managers, but people that report into managers, people that are managers, and also how to think about creating leverage for you in a company. And there's just not many people better than Andy Grove to outline what that looks like. I like to think that all the books I’ve read have helped me in some way. High Output Management in particular has really helped me become a better manager. High Output Management by Andy Grove: My second recommendation for new leaders. I will always be a total space nerd and this is a great history of the Apollo program. Andy’s book is unapologetically almost a how to manual, but kind of deconstructs the world of business into first principles. It’s like, “Here’s what matters. Here’s how to think about it. No one needs a degree. There’s a little bit of circumstantial contextual understanding that you just have to have.” But basically, at the end of the day, making business is an engineering exercise, which is brilliant for me because that actually made the whole thing about becoming CEO significantly less scary to me because engineering I understand. [Andy’s] book played a big role in shaping my management style. If you pick one person who built Silicon Valley, it was Andy. Andy exemplifies the best of Silicon Valley.